desserts – Girl Who Would be KING on Life, Style and INSPIRATION. After my recent visit to a blueberry farm let’s just say that I came home with an abundance of the delicious antioxidant packed berries. They’re ripe and in season. So I decided to try something simple but different. In the sense that I made this dessert completely gluten free. Just because I wanted to try it. And it was as good as if I had used regular baking flour, etc. Trust me on this – It really was that good! This crisp is delicious served warm or cold, with yogurt for breakfast, ice cream for dessert or simply on its own! 1.In a large bowl, combine flour, oats, sugar, cinnamon and salt. 2.Cut in butter until crumbly. 3.Press half of the flour mixture into a greased 8 or 9-inch square baking dish. 4.Bake at 350 degrees for 5 minutes to set. 5.Combine blueberries, extra sugar and vanilla extract; sprinkle over crust. 6.Top with remaining flour mixture. 7.Bake 35-40 more minutes, or until golden brown. *So here’s the big question: Are oats truly gluten-free? The short answer is YES — non-contaminated, pure oats are gluten-free. They are safe for most people with gluten-intolerance. The main problem with oats in gluten-free eating is contamination. Most commercial oats are processed in facilities that also process wheat, barley, and rye. The gluten in these ingredients can contaminate oats, and the nature of most gluten intolerances is that even a trace amount of gluten can cause severe discomfort. So that box of Quaker Oats? Probably not gluten-free. This moist, rich cake is made using whole grain flour, fruits and veggies, more “natural” sweeteners and healthy oils. Your kitchen will smell divine with the aroma of warming spices like cinnamon, nutmeg, ginger and cloves as this cake bakes. I took this original recipe and divided it into individual loaf pans to give to friends. Makes three. Instead of the usual cream cheese or traditional whipped cream topping I whipped coconut milk (without guar gum in the ingredients) with a little maple syrup & vanilla extract. It’s a much healthier alternative but the secret is to make sure the coconut milk is very well chilled. Leave the can in the fridge for at least one hour. It can also be helpful to put your mixing bowl and beaters (or blade) in as well, so everything is very cold. As far as the cake goes, you can always substitute some of the pineapple for grated zucchini (as I did for a few of them), omit the walnuts entirely and/or add raisins. I made my own apple sauce. Carrots – Carrots are one of the best sources of beta carotene, which balances the immune system and reduces the risk of many cancers. They also guard against cardiovascular disease, reduce inflammation, slow the aging process, and are great for digestion disorders. They also contain fiber, calcium, iron, and many other vitamins and minerals. Cinnamon – This spice has antiseptic properties, is a digestive aid, has anticancer properties, and is beneficial for the heart, lungs, and kidneys. It also helps lower blood pressure and makes insulin more efficient thus controlling blood sugar spikes. Walnuts – These nuts contain beneficial polyunsaturated fatty acids that are great for the brain and lowering cholesterol. They are also high in protein, fiber, minerals, and vitamins. Pineapple – Pineapple is an excellent source of vitamin C and manganese. It is also rich in the enzyme bromelain, which aids in digestion, is an anti-inflammatory, and an anti-cancer agent. It can greatly reduce the swelling of carpal tunnel syndrome, arthritis, and gout. Add the dry ingredients to the wet ingredients and mix together gently. Bake at 350ºF until a toothpick comes out clean, approximately 40 minutes (20 minutes for cupcakes in a muffin tin). Cool and serve. The lady and the tart. It began with a bunch of Pink Ladies. They looked so fine – I decided to put them to good use. the ladies (cut in quarters) are caramelizing with the help of a turkey baster (not in recipe). I like to challenge myself in general and many times it involves cooking. When things get too comfortable I like to switch it up and expand my repertoire to make meals more unexpected and interesting. I love trying new things and just when I think I’ve tried them all I find another recipe to inspire me. For desserts I have my standards that I know work out but pie crust pastry at the best of times is always challenging to get it just right especially if you prefer using butter over lard or Crisco (as per Martha Stewart and moi). For Easter I made dinner for eight and decided to attempt a new dessert. It was going to be elegant and impressive. According to the recipe it was supposed to be shockingly simple to make, and it was shocking all right but in a messy, hard to assemble kind of way. Another Option: shown in stages with apples cut into slices & pre-packaged crust. I should have realized this beforehand because anything that requires flipping over I usually end up flipping out over. My omelettes usually turn out to be fancy looking scrambles (or scramblets as I like to call them). They might taste good but they’re not your typical perfect looking omelette. Still working on it. My pan is usually to blame. The lip is too deep or something like that. But perhaps, just saying…maybe I’m not a natural born flipper. What made me think it would be different for an apple tart? This was a French Tarte Tatin (maybe I just liked the name) – a show-stopping dessert baked in a cast iron pan (I’m a big fan of cast iron like Dustin Hoffman’s character in Meet the Fockers). 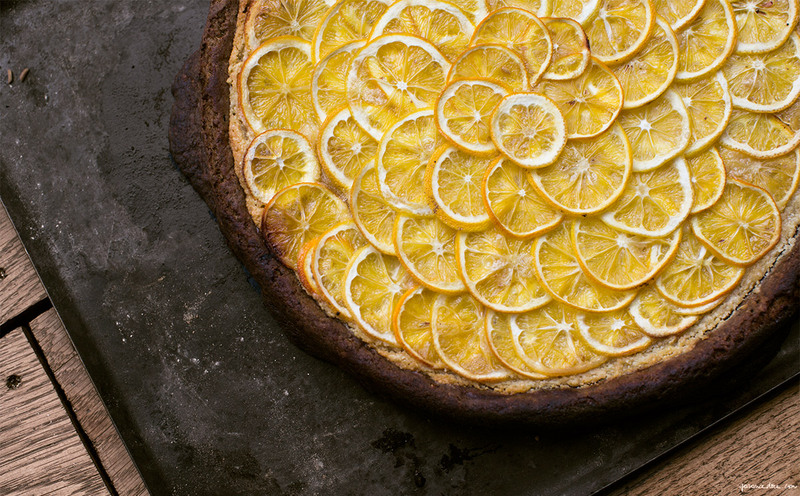 I liked the photo and the fact that you don’t have to par-bake the crust. Traditionally it’s made with puff pastry but making puff pastry from scratch takes a long time. Never say “should have” but – should have used puff. when it came out of the oven – not supposed to look perfect – only taste so. 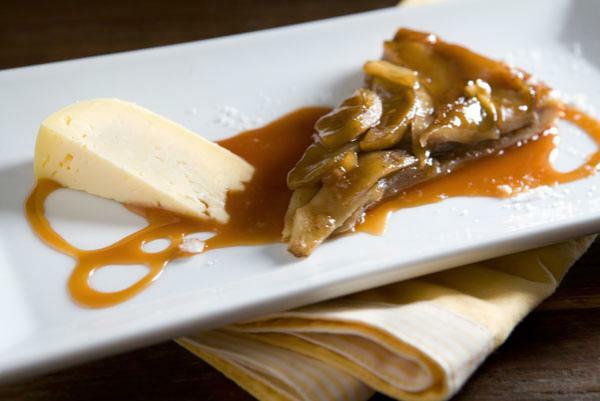 dessert reconstructed – but delicious nonetheless (very important!) – apple pie in a bowl. By some miracle I managed to turn this flop into a fabulous dessert with some quick thinking. No one even knew it wasn’t supposed to turn out this way. The original recipe is below (with some added comments) but here’s what happened. At the start everything looked great and even taking it out of the oven it looked almost perfect and smelled amazing. Should have left it in the pan. But no; had to flip it over onto a wood cutting board….that’s when it fell apart. So instead of crying I was a big girl about it. Scooped it into individual little round bowls that could be put back into the oven just before serving. Topped with a scoop each French vanilla & whipped cream, a chocolate wafer on top...Pffff. Everyone said it was delicious even the crust. And I forgot to drizzle dulce de leche over the ice cream. *Ideally, but remember if it falls apart, you have another option. Or, just serve it straight from the pan if you suspect it may fall apart. Let me know how it works out for you – but don’t tell me it worked out perfectly. 1/4 cup Calvados or Cognac (optional). I didn’t have either so substituted with a little less over-proof rum (brought home from my Appleton Rum factory tour in Jamaica & still potent as ever). This helps to caramelize the apples but you can try omitting it entirely. First, make the pastry. On a clean, flat surface, combine the butter and flour, tossing the butter through the flour to coat on all sides. Using a rolling pin, roll the butter into thin strips, using a pastry scraper or the back of a large knife to lift any stuck bits from the surface or the rolling pin. Keep doing this until all the butter is in long strips. Add a few tablespoons of water and then lift and fold the mixture using a pastry scraper or back of a knife. Continue adding water, a few tablespoons at a time, lifting and folding the mixture to incorporate each addition until the dough just starts to come together. Use your hands to flatten the dough, then fold it over itself. Do this until the dough is a cohesive mass, but is still very pliable. You don’t want to overwork it. Useful Tip:use parchment paper to help you. On a well-floured surface roll the dough to the size of your cast iron pan. Transfer the dough to a parchment-lined baking sheet, and refrigerate. Next, assemble the tart. Preheat the oven to 400°F. In a medium cast iron pan over medium-high heat, melt the butter and sprinkle the sugar evenly over top. 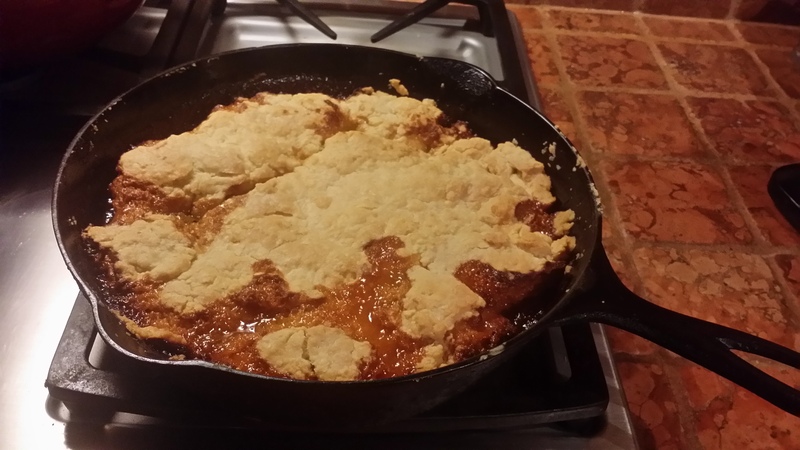 Place the apple quarters in concentric circles around the pan, flat side down. 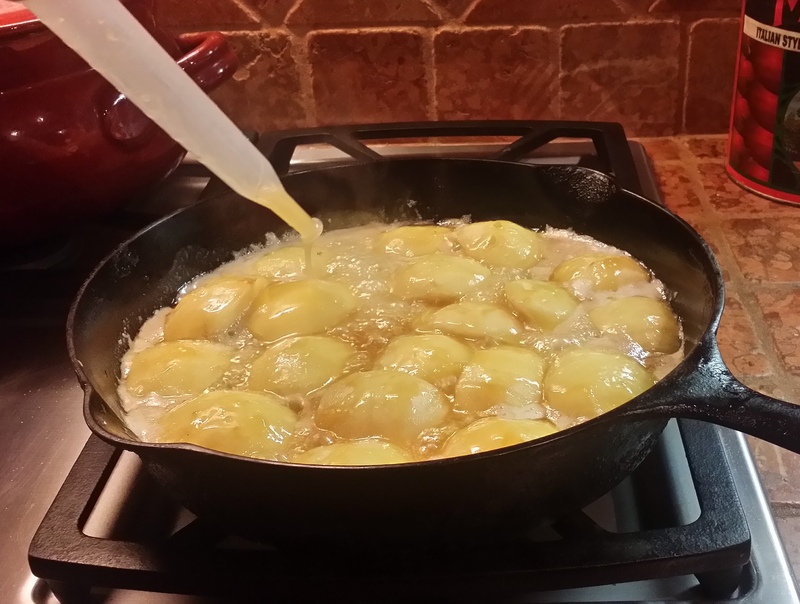 Pour the Calvados or Cognac over top, if using, and let the apples slowly caramelize. 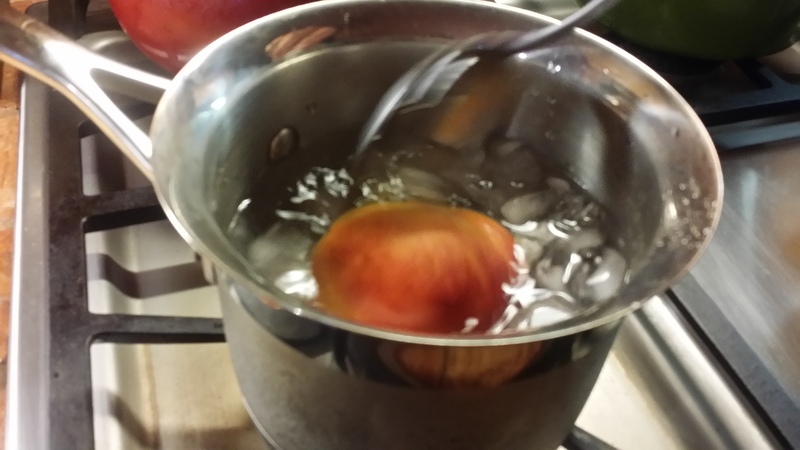 When the liquid around the apples turns medium brown, remove the pan from the heat. This should take about 20 minutes. Useful Tip: use a turkey baster to help baste liquid over apples. Remove the dough from the refrigerator and place it on top of the apples. Immediately place in the oven and bake for about 30 minutes, or until the pastry has browned nicely. Let it sit for at least 10 minutes (or up to 30), and then put a board or plate on top of the pan. 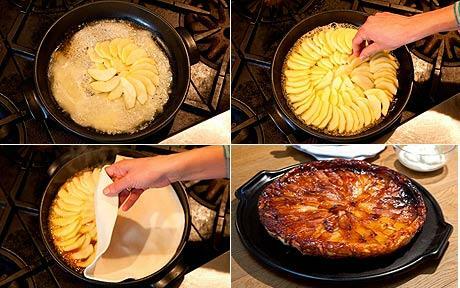 Carefully flip the whole thing over; the tart should pop out quite easily (ha, ha). If an apple or two sticks to the pan, use a fork to put it in its rightful place. Serve immediately, or wait a few hours (or even a day) and warm gently in the oven before serving. 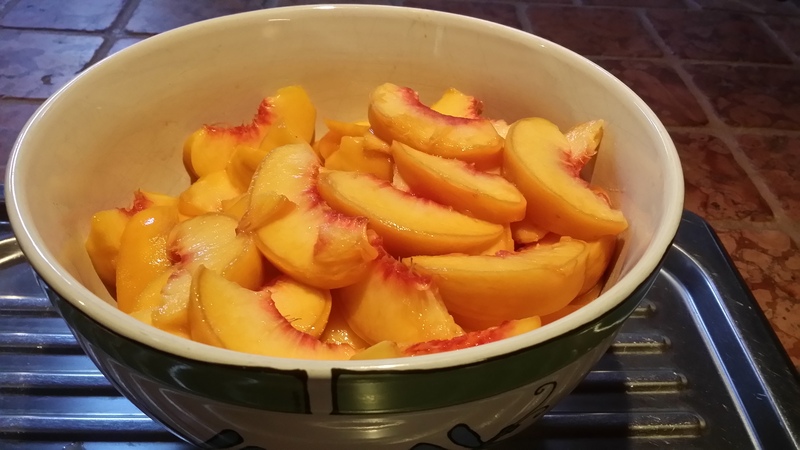 If you saw my post yesterday then you saw the photo of the big barrel of peaches from the Okanagan – soon to be out of season. They were the tastiest, juiciest I can ever remember having. What to do with them all? Of course I gave some away but can’t possibly eat all the rest before they start to go bad. 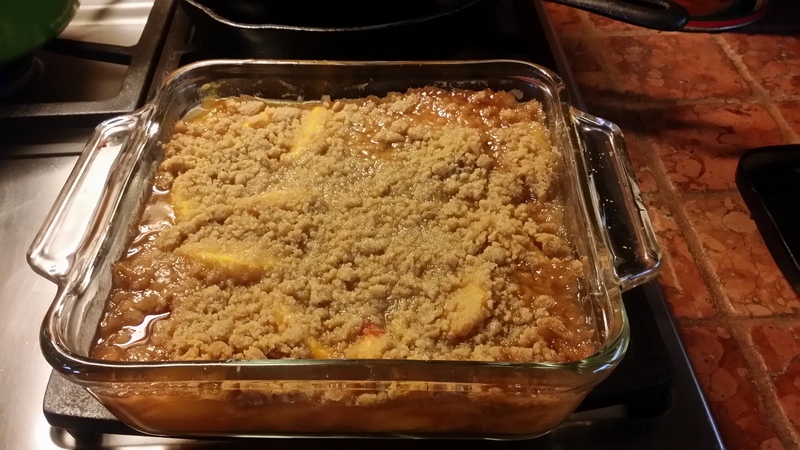 I decided to make peach crumbles instead of pies. Why? You can cheat on not having to make pie crust which is more time consuming and finicky especially if you like using real butter instead of lard (as I prefer, per Martha Stewart). Also crumbles are lighter, you get to taste more of the ripe fruit which is in season this way and then you can eat twice as much (ha). Top with vanilla or caramel ice cream for perfection. If you want to add liquor (as some people like to) then add some rum or brandy to the filling. I prefer it just as is maybe a shot of brandy on the side. Peachy clean! You must first remove the skin. The easiest way is by blanching. 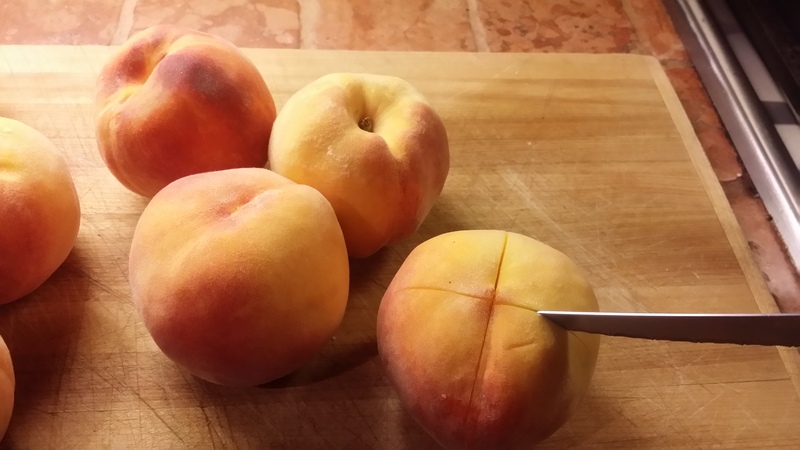 First you need to cut an X into each peach with a knife as in the photo above. Have two pots ready. One with boiling water, another with ice water. Take one by one by slotted spoon into a pot of rapidly boiling water for about 15 seconds each. With same spoon drop gently into another pot filled with ice water. This cools it to make it easier to peel and also stops the cooking process. See how easy it is? 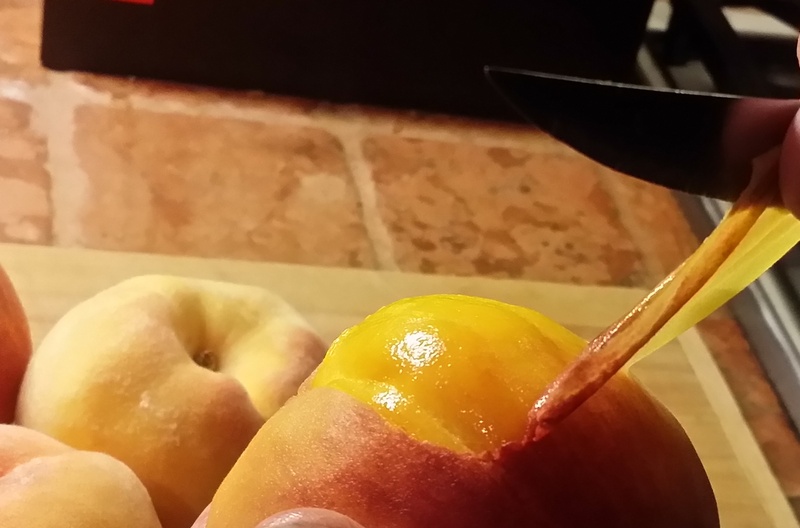 And to think I invested in a soft fruit skin peeler! Preheat oven to 375 degrees. 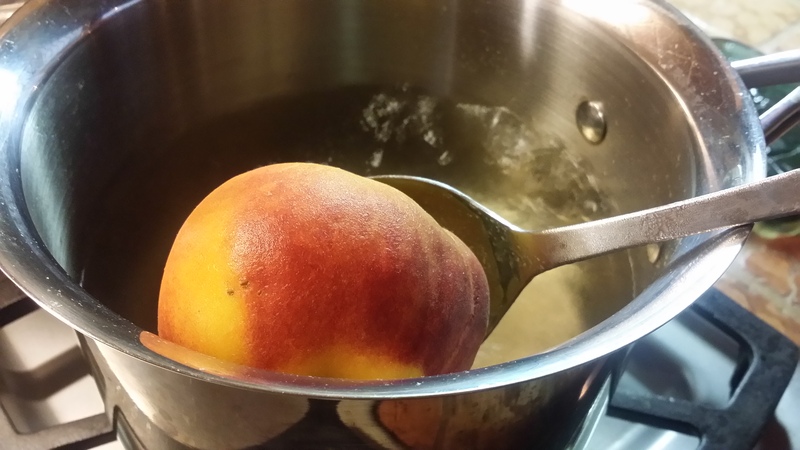 Make the filling: Combine peaches, granulated sugar, lemon juice, cornstarch, and salt. Transfer to an 8-inch square baking dish or pyrex pie plate. Make the topping: In a large bowl, using a mixer, beat butter and brown sugar on medium until light and fluffy. Add flour and salt and, with your hands, mix until large pieces form. Scatter over filling. Bake until center is bubbling, 40 to 50 minutes, tenting loosely with foil after 30 minutes. Let cool 20 minutes before serving. Square or Round? I did both but prefer the round shape. I think it tastes better. COOK’S NOTES: the topping freezes well, so why not make a double batch and save half for another day? CONFUSED between Crisps, Crumbles and Cobblers? You’re not alone. Crisps– Crisps have a bottom layer of fruit, but their topping is much more crunchy than cobblers. Instead of a dough-like pastry that rises, the crisp is topped with mixture of butter, sugar and flour that is mixed together until ‘crumbly’ and is briefly browned in the oven. Crisps might include oats or granola in their topping as well. 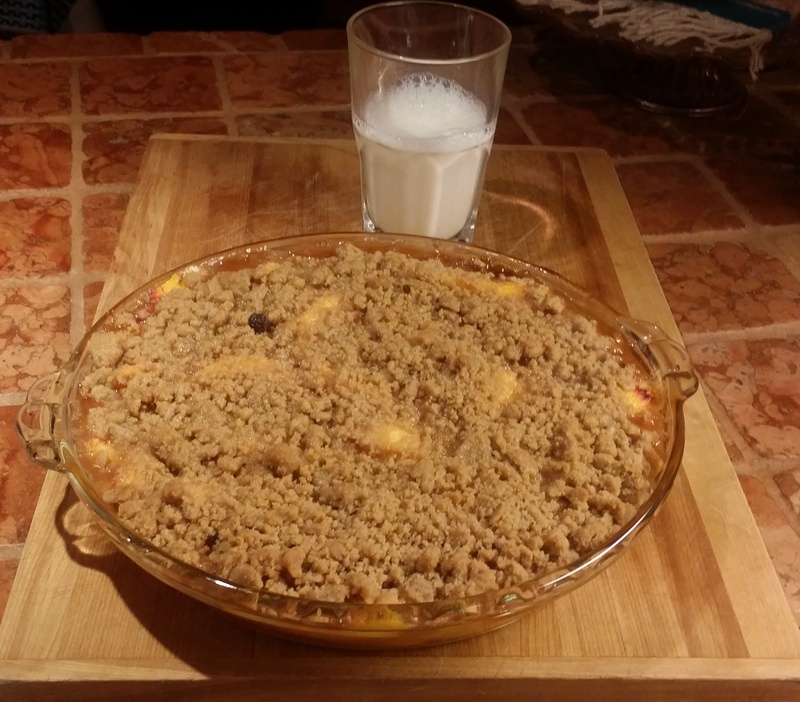 Crumbles– The crumble also begins with fruit at the bottom, but is topped with a different butter-flour-sugar mixture called a ‘streusel’. The three ingredients are mixed just until crumbly and then poured on top of the fruit. This dish is very similar to a crisp but the crumble originated in Britain whereas the crisp is seen as more American. Crisps are also more rich than crumbles with higher amounts of sugar, butter and flour. Cobblers– Cobblers also have a bottom layer of fruit but are topped with biscuit dough. The result is a dense, rich dessert. Most popular cobbler ingredients include apples, peaches and cherries. 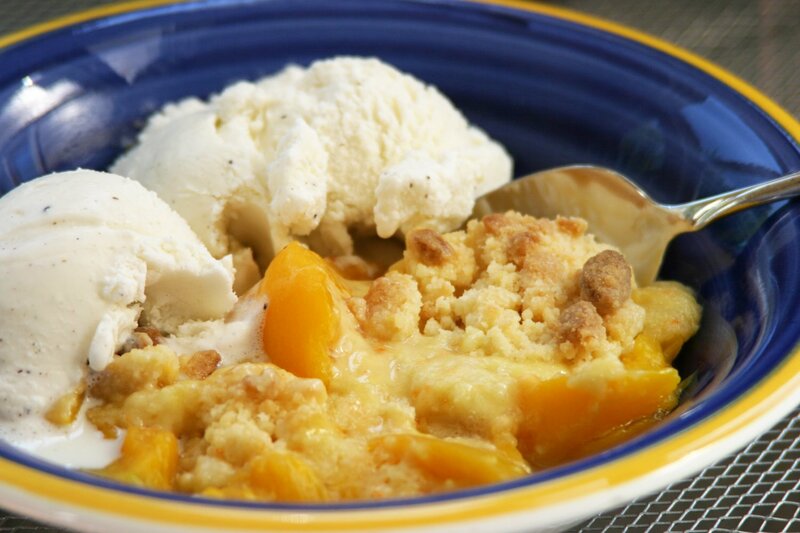 Call it a crisp or call it a crumble but it’s not a cobbler…and all I can call it is good! Lemon tarts are one of my favourite desserts. Chef James Henry from the restaurant Bones in Paris has perfected the lemon tart, according to Garance Doré and her team who visited the restaurant while in Paris. He shares his recipe which is big enough for a large dinner party, or to last you a while if you’d prefer not to share. 2 ¾ cups of pastry flour (preferably *type 55 bio which is an organic lump-free wheat flour from France – which is what they used for this recipe). You can use all-purpose. Mix dry ingredients, stir. Add butter and fold in. Finish with wet ingredients, stirring to an even consistency. *the type flour used for this recipe – see #’s below. Voila ! Bon appetit ! 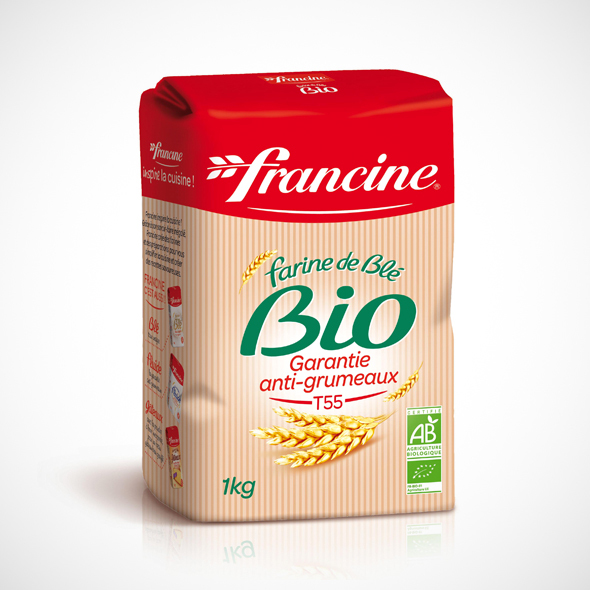 French flour type numbers indicate the ash content (in milligrams) per 10 g flour. The numbers are a factor 10 lower than the German types. Type 55 is the standard, hard-wheat white flour for baking, including puff pastries (“pâte feuilletée”). Type 45 is often called pastry flour, and is generally from a softer wheat (this corresponds to what older French texts call “farine de gruau”). Some recipes use Type 45 for croissants although many French bakers use Type 55 or a combination of Types 45 and 55. Types 65, 80, and 110 are strong bread flours of increasing darkness, and type 150 is a wholemeal flour. Note that there is no type 40 French flour like the German type 405, the closest is type 45. From savoury to sweet. 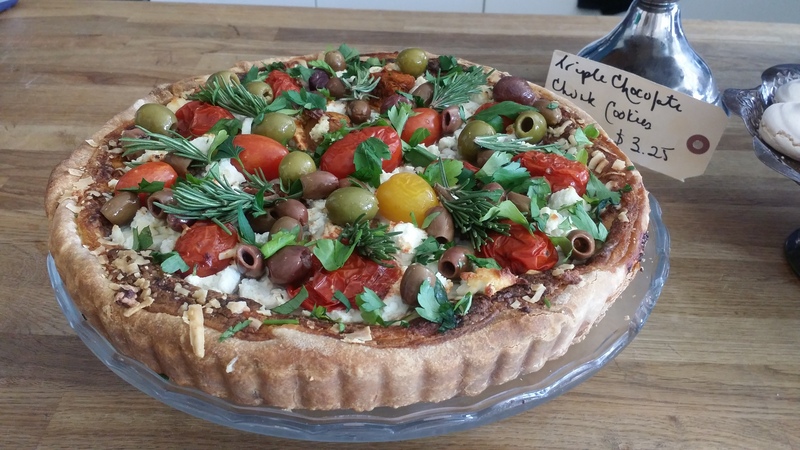 I’ve been making so much savoury the last while that it was time for a sweet treat – and I mean SWEET! 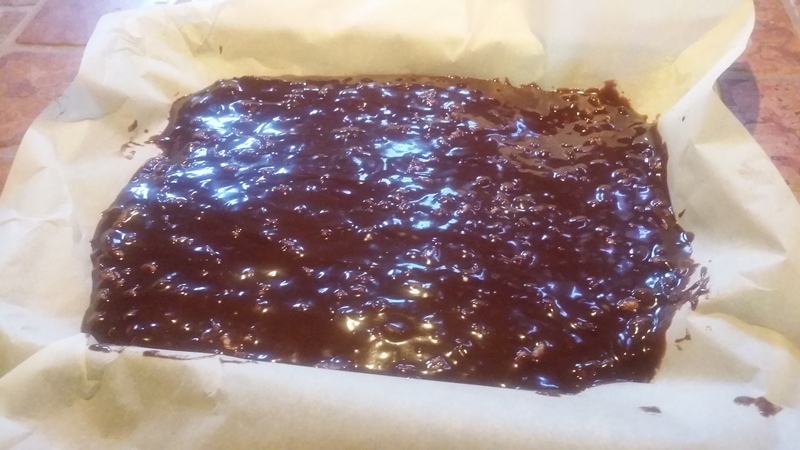 This is the first time I’ve made chocolate bars from scratch. Cakes, cookies, fudge, truffles, different types of chocolate bark and even brownies is what I’m used to, but never bars. Just never attempted to try them before. Why now? Why not! This recipe happens in 3 stages. The end result tastes like a deliciously rich fudge brownie with a caramel-like consistency in the middle. Read through the whole ingredient list and instructions before diving in. If you want to attempt this (or any candy making) I really recommend that you buy a *candy thermometer or better still, a laser thermometer for this recipe. Line a 9×13” baking sheet with some parchment paper, leave a little bit spilling off the sides. Melt chocolate and butter together and cool. Add eggs then remaining ingredients to the melted chocolate. Spread in your lined 9×13″ sheet and bake for 10 minutes at 350′. DO NOT OVERCOOK. Mix ingredients together and then cook to “softball stage” over medium/low heat (softball stage means a candy thermometer reaches 240F ). Spread over your baked layer. Melt together and spread carefully on top of powdered sugar mix. Cool in refrigerator for several hours until top chocolate layer is hard. Cut into small bars and store in refrigerator. 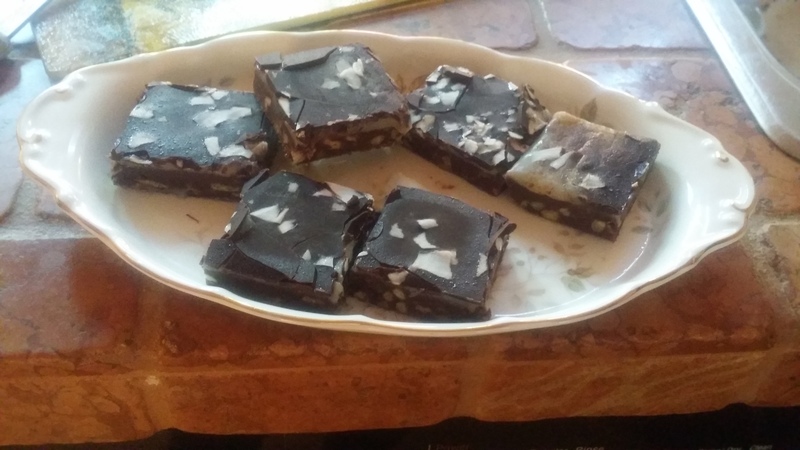 I cut them into brownie-style squares and put unsweetened coconut on top – stage three. Stage One was easy enough. The key with this first step is NOT to overcook the layer. So if you have an oven that runs hot, bring the baking time down by 1-2 minutes. Stage Two – The softball stage is bit of a pain. *I didn’t have a candy thermometer and at the time I decided to make this, all the ingredients were in place except for the handy thermometer. Being the practical person that I am, I ended up using a meat thermometer instead – was too impatient to go out & buy a proper one on the spot. So I used one I have for roasts and it only goes up to 200F so I let it go up all the way to the very end past 200 (I figured this to be about 220) and left if for an additional 2 minutes. Luckily for me it worked out fine but I wouldn’t normally recommend doing this. Stage Three was no fuss. 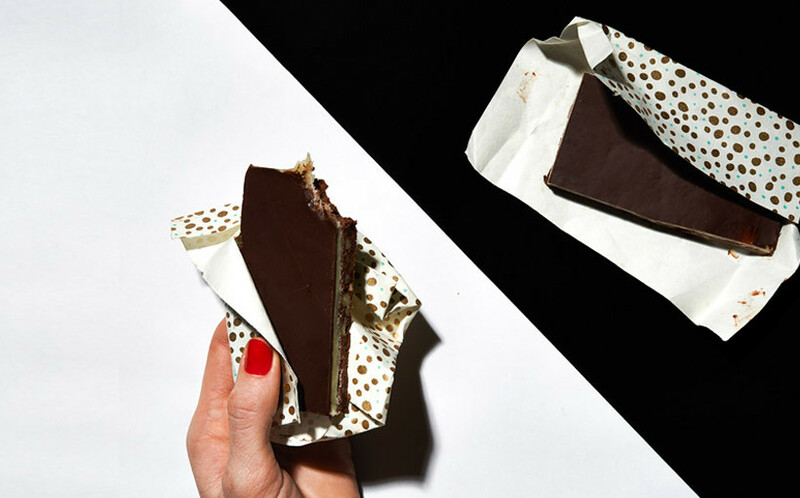 You can find some fancy wrappers at a kitchen store or use plain parchment to wrap them. They freeze well. 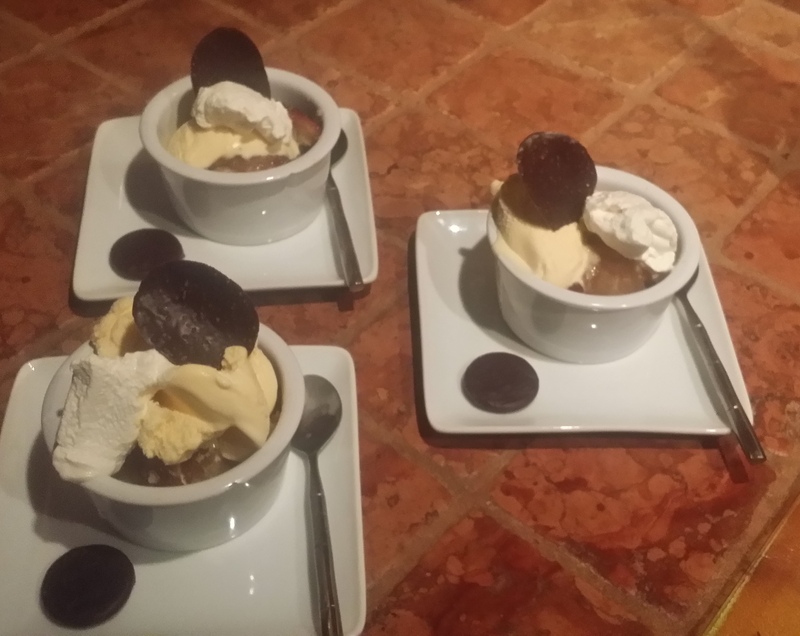 Stage Four – eat and enjoy. They’re sweet but not sickly sweet. You may want to eat more than one but try to use control. I’m trying. 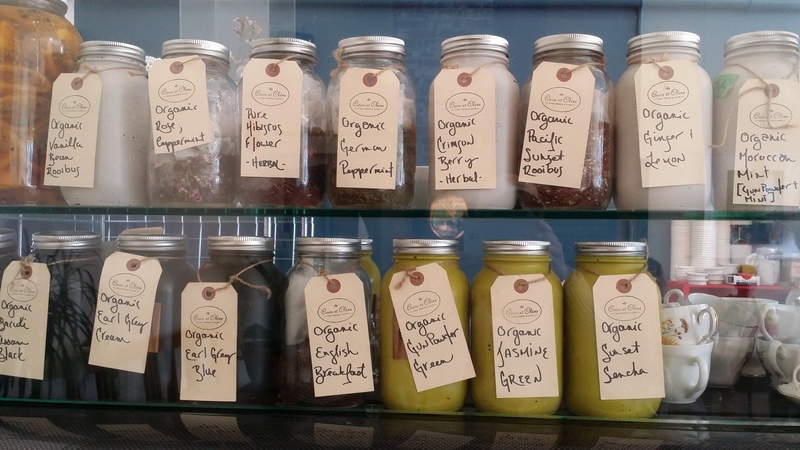 This is the food website of Elettra Wiedemann, the daughter of Isabella Rossellini. There are still a few tickets available for the DOWNTOWN FOOD & AGAVE SAFARI on Thursday May 28th – 7pm. There are so many factors that go into a good food item like the three things mentioned above. Besides dinner… there’s breakfast, lunch & snack time. What appeals to you at one time might not at another. Like when you crave a simple but well made grilled cheese sandwich or clubhouse and another time something totally different like chicken pot pie (which I personally never crave but some people do). 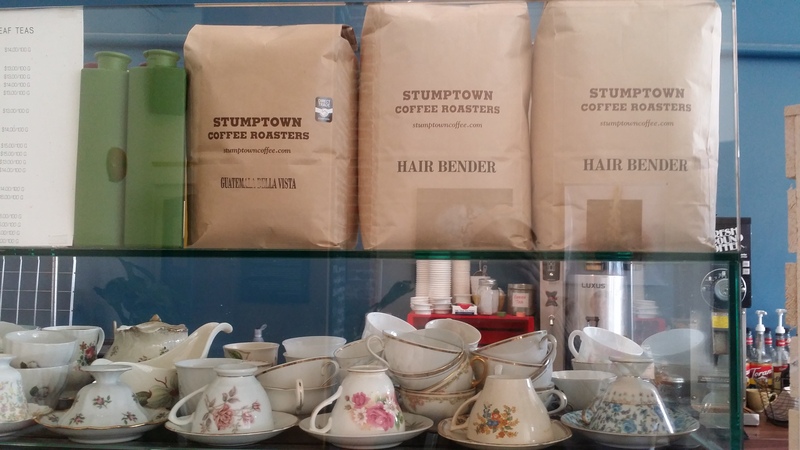 Sometimes you come across something you see regularly in almost every restaurant or coffee shop but something looks different about it. It somehow looks fresher, more appealing and makes you want to bite right into it. 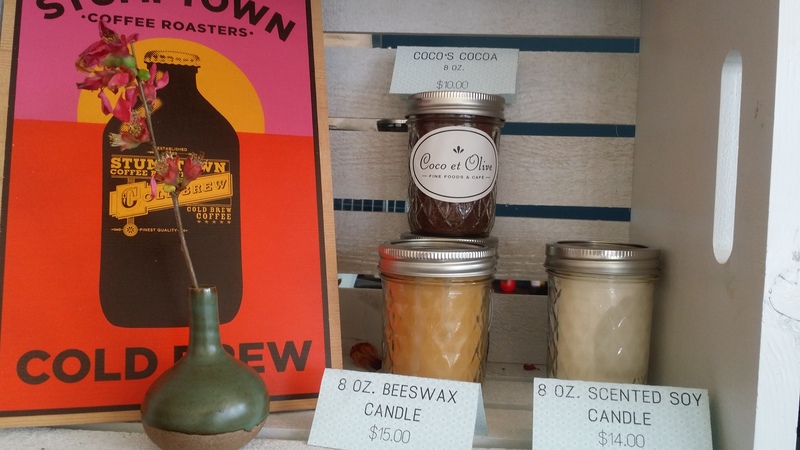 I had that experience recently at Coco et Olive on Main street. 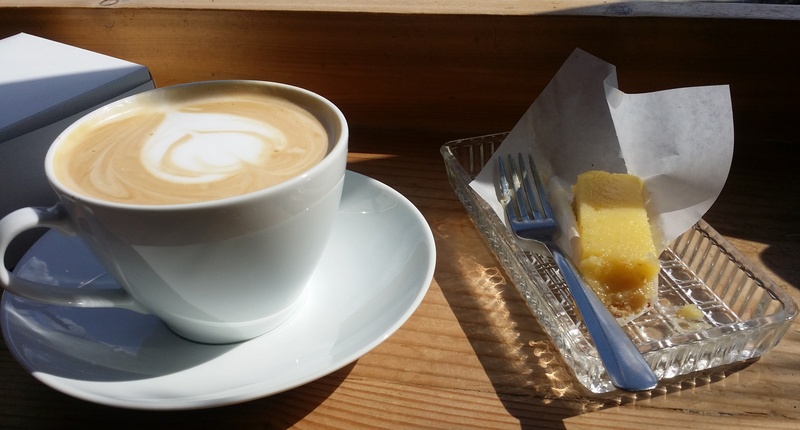 I was going for a simple latte and mid-afternoon snack but looking at all the goodies at the counter made it a challenging situation to choose only one thing. At times like this you have to make a difficult decision. You order something, take another thing home and decide to come back again and again to try everything you never thought you wanted. See what I mean? 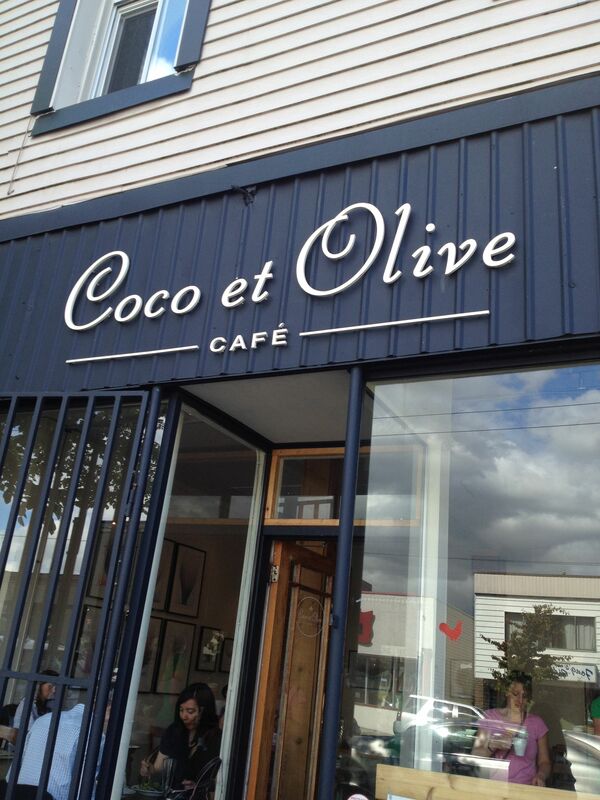 Coco et Olive Cafe – 3707 Main St. 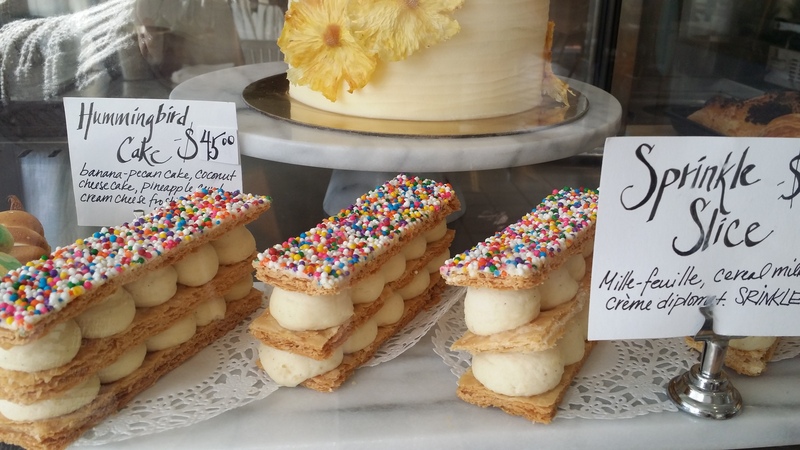 These pastries look so yummy. Liberty used to be in my neighbourhood (it was called Elsie’s then). They moved away and I couldn’t find them for ages until I came across the bakery by accident on Main Street. 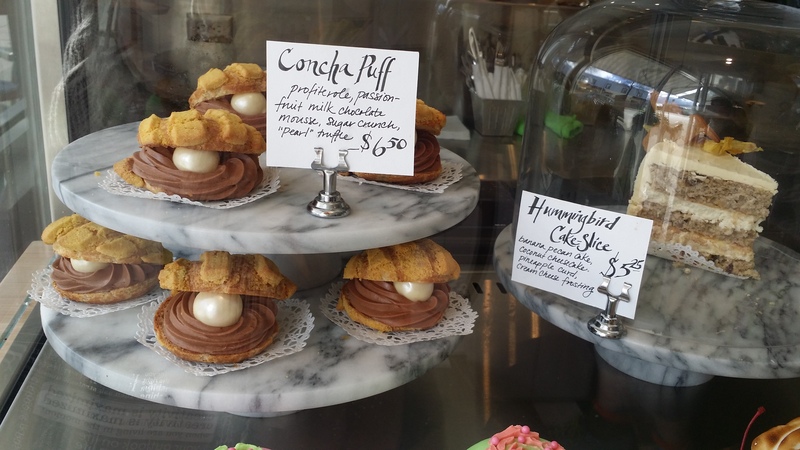 I spotted the buttercream & mocha petit fours I love and used to buy regularly in their window. What do you usually crave for snacking? Chocolate + Almond = Delicious Cookies! 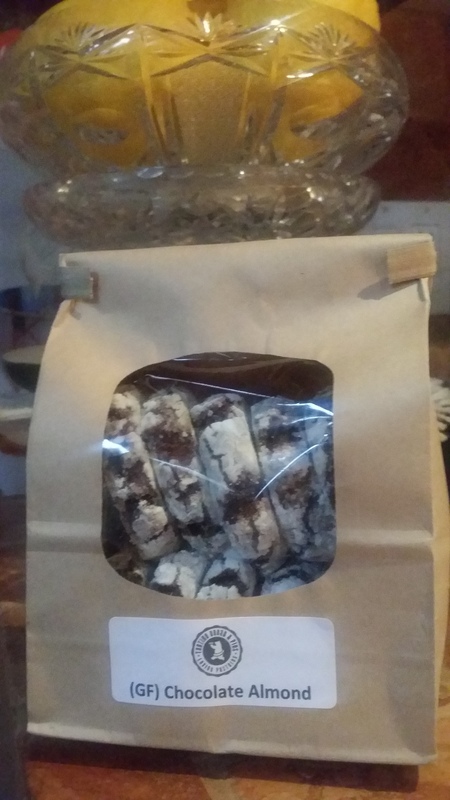 I was looking to buy a bowl of soup and Tourtière (a Québécoise meat pie) from Tartine bakery in Vancouver when I discovered this delightful bag of cookies. 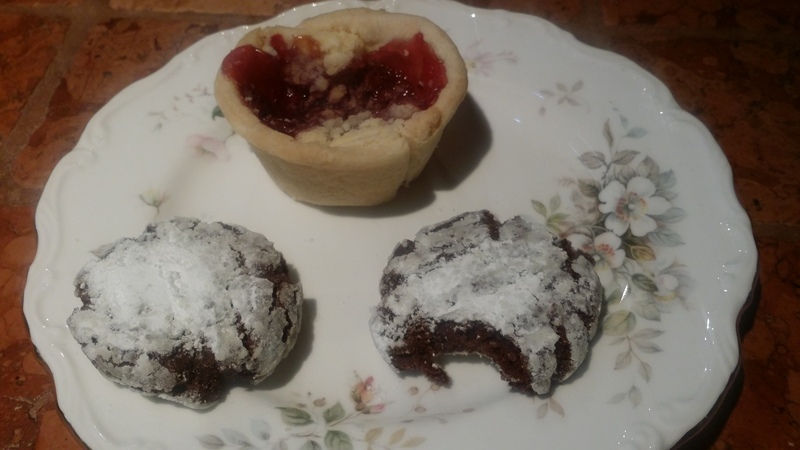 They tasted amazing, so light and chewy with the perfect combination of almond to chocolate. It really reminded me of another dessert I make – a chocolate almond torte but in cookie form. Since I don’t have their exact recipe here is the next best thing. Just add icing sugar to finish it off. That’s a sour cherry tart in the middle – for a little variety. 1. 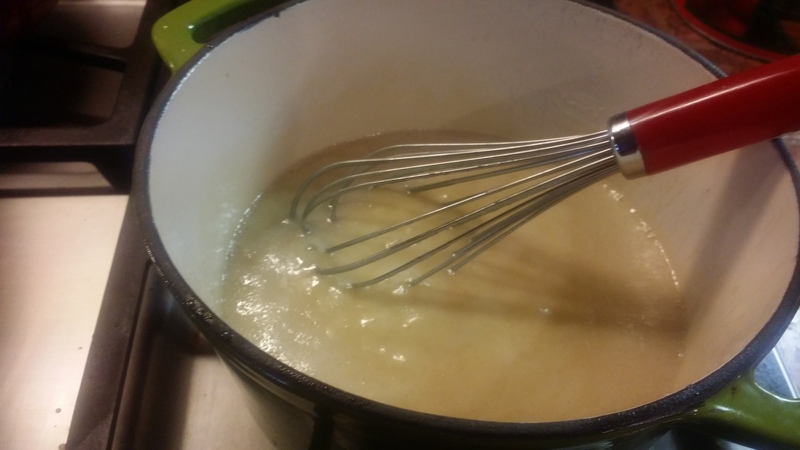 In the bowl of an electric mixer fitted with the paddle attachment, cream the butter and both sugars until light and fluffy. 2. Add the vanilla, then the eggs, one at a time, and mix well. Scrape down the sides of the bowl after the addition of each egg. 3. Sift together the cocoa, flour, baking soda, and salt. Turn your mixer to low and gradually add the sifted ingredients; mix until just combined. 4. Fold in the chocolate chips and almonds. *Refrigerate dough for 1 hour. 5. 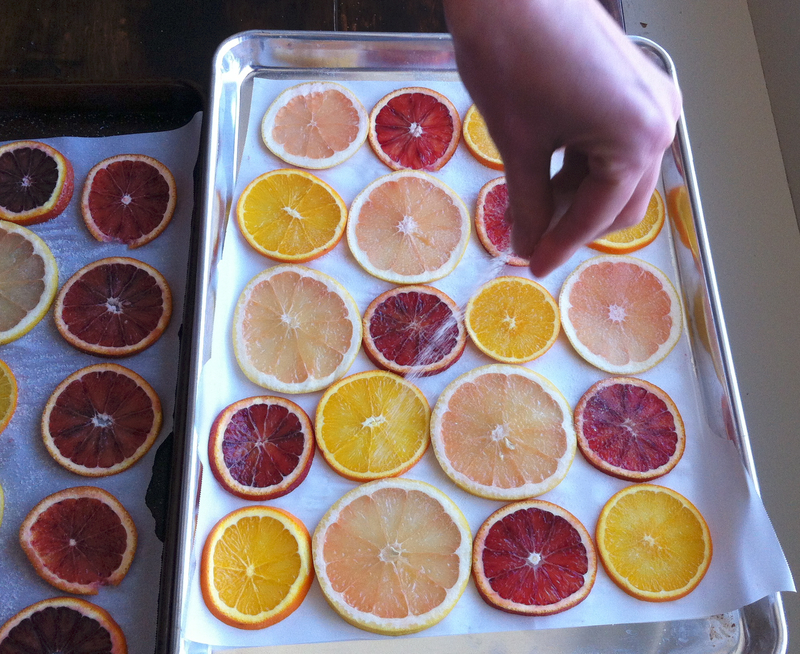 Preheat the oven to 350 degrees F. Line a baking sheet with parchment or a silicone baking mat. 6. Measure the dough using a 1 1/2 tablespoon scoop or a rounded tablespoon. Roll the dough in your hands until it forms a uniform ball and place on your lined baking sheet. 7. Bake the cookies for 11-12 minutes (the cookies will seem underdone). Remove from the oven and let cool slightly (about 3 minutes) and transfer to wire rack and let cool completely. *Trick: stick the dough in the freezer for a little while to allow the flavors to marry and the dough to slightly stiffen. It makes it easier to form the cookies with. 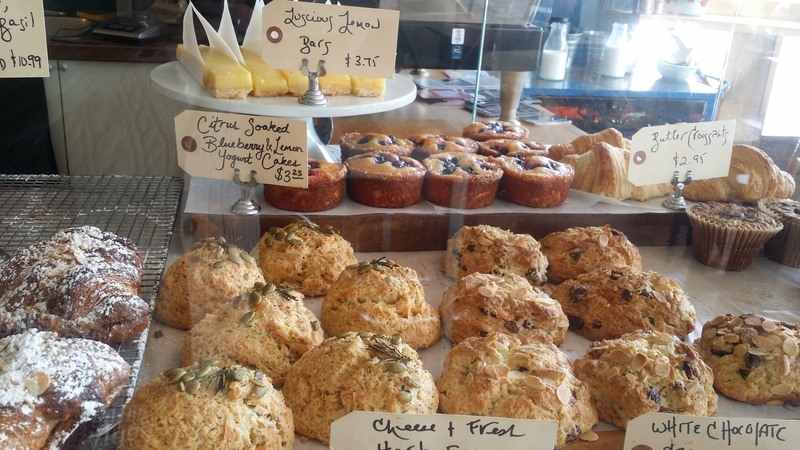 Tartine Bread & Pies: 770 Beach Ave, Vancouver. p.s. I think this post was influenced by yesterdays post. Have your Cake and eat your Candy too! Look what I found! Perhaps it’s because I’ve spent a lot of time in Mexico and never had an easy time of breaking the piñatas, or maybe it’s just that I love eating candy. Here you can have the best (or worst) of both worlds and it’s a whole lot easier to break through. My dream filling would be smarties, gummi bears, licorice bites, mars, snickers and kit kat minis, sour patch kids and jelly bellys with a sprinkling of marshmallows. I have not yet make this kind of cake but doesn’t it look appealing? Hey, there’s always a birthday or an occasion. To make this wonderful rainbow piñata cake first you have to bake two semicircular cake sponges (find a sponge cake recipe if you don’t already have one – it’s not that hard). Scoop out the center of both the sponges and fill the lower one with candies. Join the upper semicircle to the lower with frosting in between. Then divide your buttercream frosting (if you don’t already have a recipe just find one) in three to four parts depending upon the number of food colours available. Colour each part with a different food colour and fill the piping bag with dollops of alternate coloured frostings. Make sure not to mix them. Pipe out rosettes on the cake and voila! 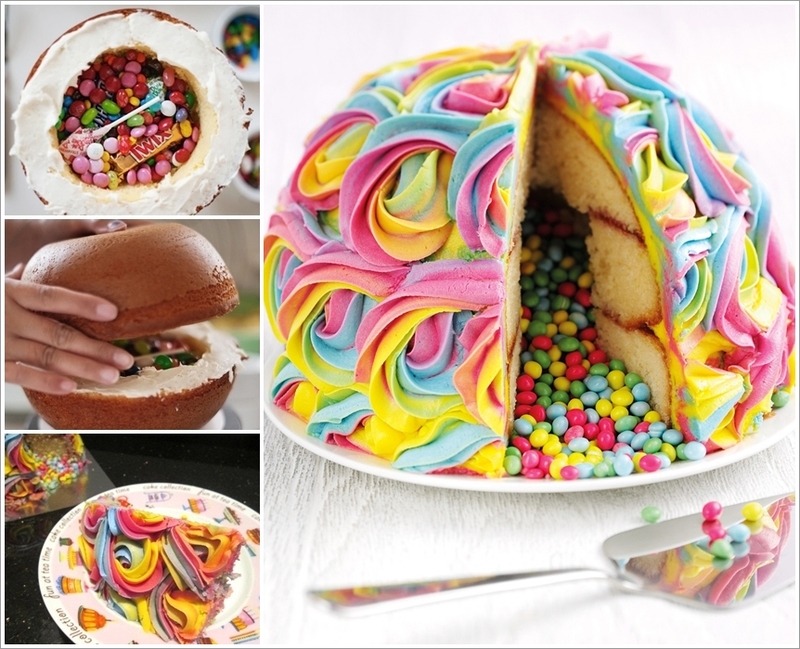 Your rainbow piñata cake is ready. OR; you can keep it real simple and just hollow out a cake recipe you’re already familiar with & fill it with candy. Just don’t forget to put the top back on. Frost it however you like. What would you fill it with? Sprinkle generously with sugar. Dry them in a 200F oven, flipping once, until crisp, about six hours. 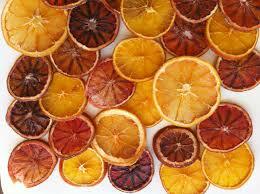 They would also dress up a hot toddy or sangria. And they look so pretty!